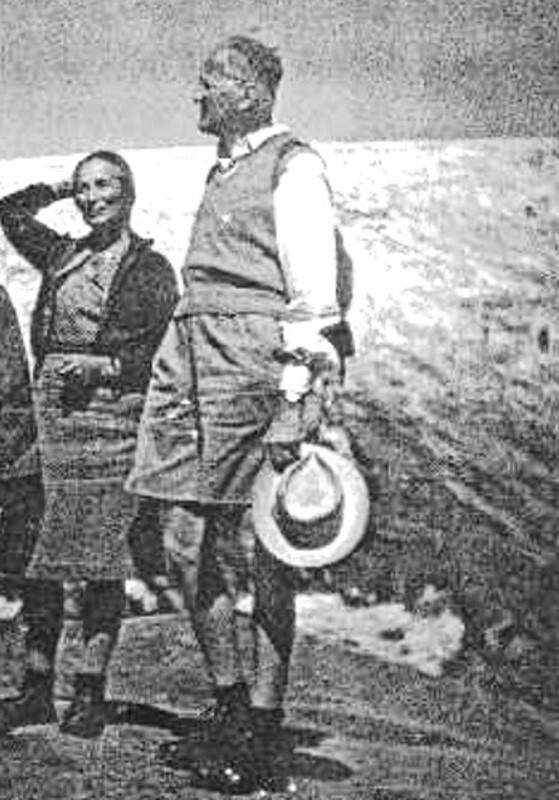 A summer shot of Pevsner and his wife on the holidays which got rarer as The Buildings of England progressed – hiking in the Tyrol and suitably dressed for it. I’m told the previous link to the full Pevsner bibliography is broken – so here‘s a new one. There will be a selective bibliography in the paperback edition, which should be out at the beginning of April 2013 from Pimlico. One of the gifts of google to the biographer is the ability suddenly to put a face to someone who has just been a name. Birkbeck College has put online a collection of its historical photographs, and amongst them is an image of George Francis Troup Horne, who was Secretary to the college and Clerk to its Governors from 1919 to 1952. He was also one of the most significant contacts of Pevsner’s life, in that it was Troup Horne, a neighbour in Hampstead, who seems to have suggested to Birkbeck that they might use Pevsner as a lecturer during the war, when many of the college’s regular staff had been called up. Pevsner’s first lecture at Birkbeck, early in 1940, was entitled ‘Enjoyment of Architecture’. 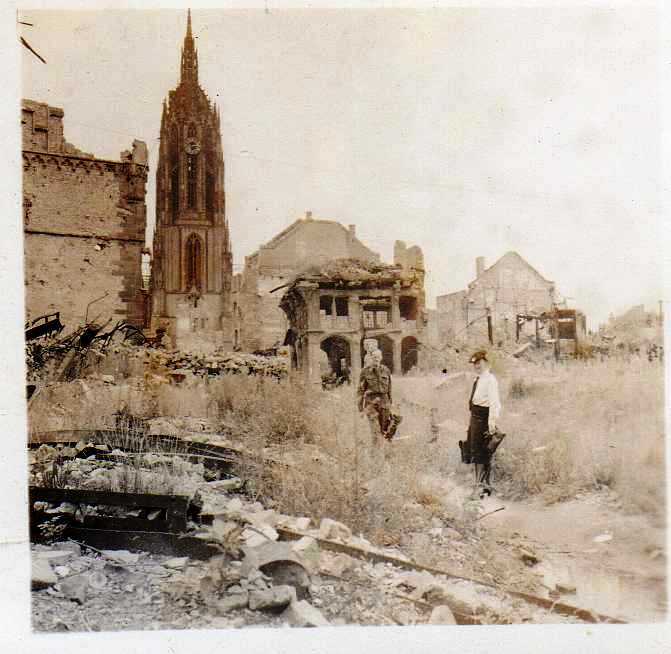 By the time he gave his second, he had been briefly interned as an enemy alien and spent an equal number of months clearing the remains of bombed buildings from the streets of North London. 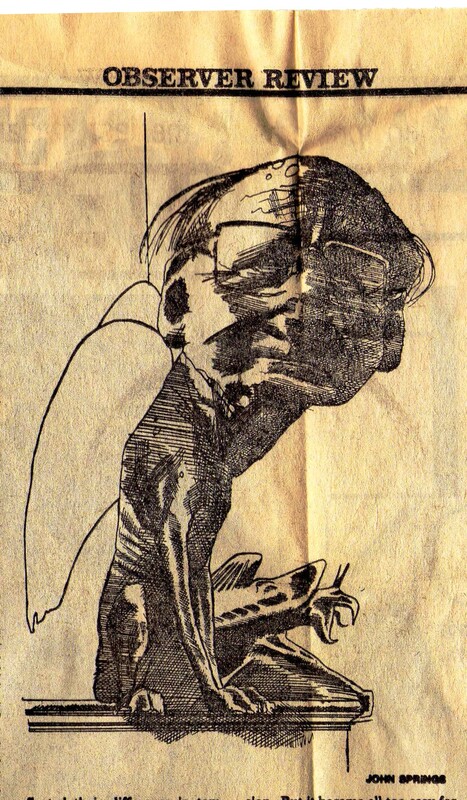 The first talk was not followed by any offer of regular employment, and Pevsner’s second appearance was not in Birkbeck’s lecture hall but on its roof – again, probably thanks to Troup Horne. After the devastating fire bombing of the City on December 29, 1940 – the ‘second Fire of London’ – compulsory firewatching was introduced. Standing between Chancery Lane and Fetter Lane, Birkbeck – then in Bream’s Buildings – had been lucky to escape the worst of the damage in the City and it was now anxious to comply with the regulations. Pevsner was signed up, and saw it as a welcome release from rubble-shovelling: ‘It is by no means the kind of return to academic surroundings that one would fancy,’ he wrote, ‘but it is a decided improvement’. Troup Horne also took his turn on the roof, and seems to have put the time to good use. A portly man, he was an excellent cook and selected members of the college would sometimes receive a welcome invitation: ‘Mr Troup Horne presents his compliments and has prepared a pigeon pie’. 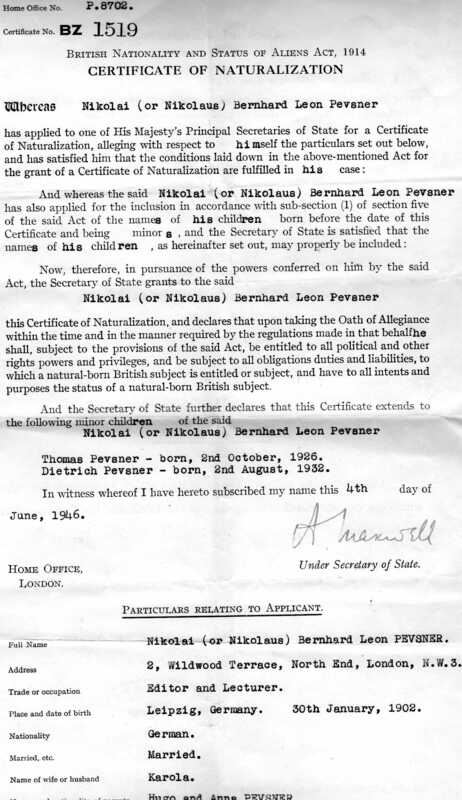 Troup Horne would feature again as a mentor after the war, this time as one of the four sponsors of Pevsner’s naturalisation as a British citizen. He is commemorated in London I: the Cities of London and Westminster, published in 1957, four years after his death: ‘To the memory of G. F. Troup Horne and the nights of 1941-1944 at the old Birkbeck College in Bream’s Buildings’. 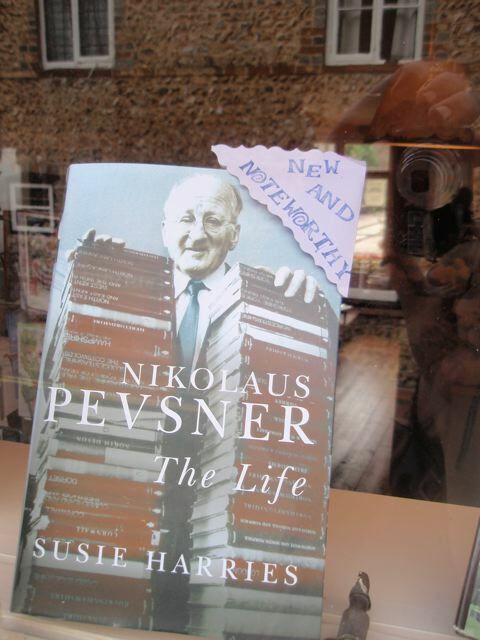 Much Ado Books in Alfriston, Lewes, have given their window over to a splendid Pevsner display, with the man himself peering benignly out of the window of one of ‘his’ buildings. It’s very good to see that affection for him is no less enduring than respect. In 1944, while he was sitting in at the Architectural Review for Jim Richards, Pevsner described himself as ‘working on a Chart’. 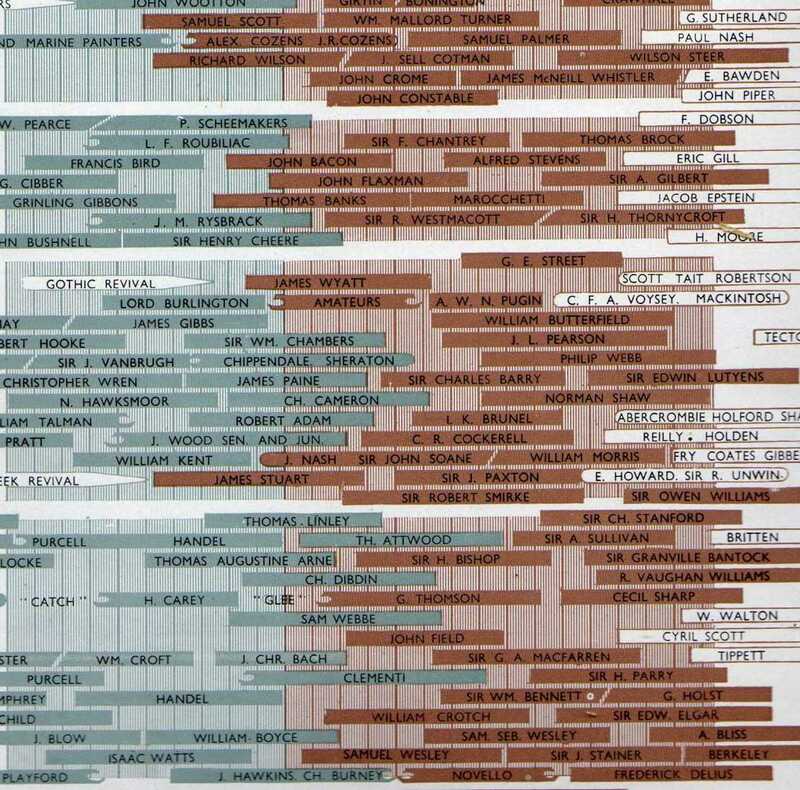 This was probably the curiosity which emerged from the Architectural Press in 1949 under the title ‘‘English History at a Glance’ – a slim volume the size and shape of an atlas which identified the milestones in each area of human progress and plotted them all on a single map. 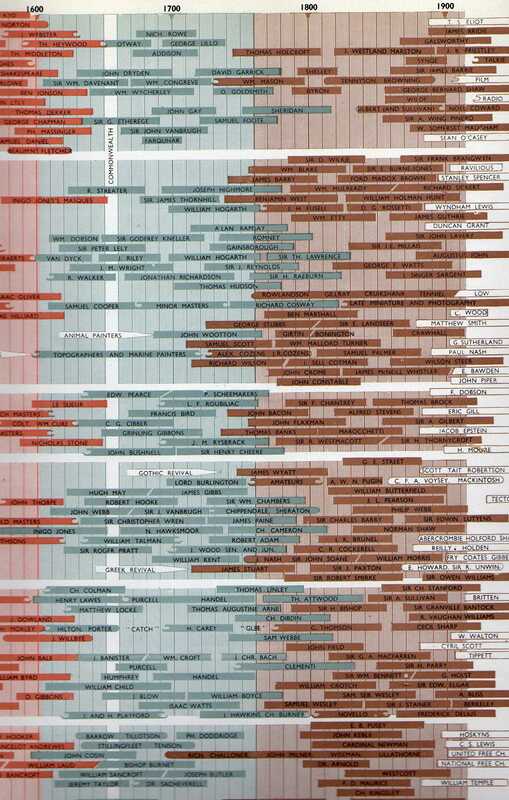 Modelled on the German Kulturfahrplan or ‘Culture Timetable’, the ‘Chart’ coordinated events and individuals ‘according to the changing spirit of ages’ – very much Pevsner’s kind of thing: running one’s eye down the Chart, one could read off the simultaneous developments in art, science, politics, economics and religion. 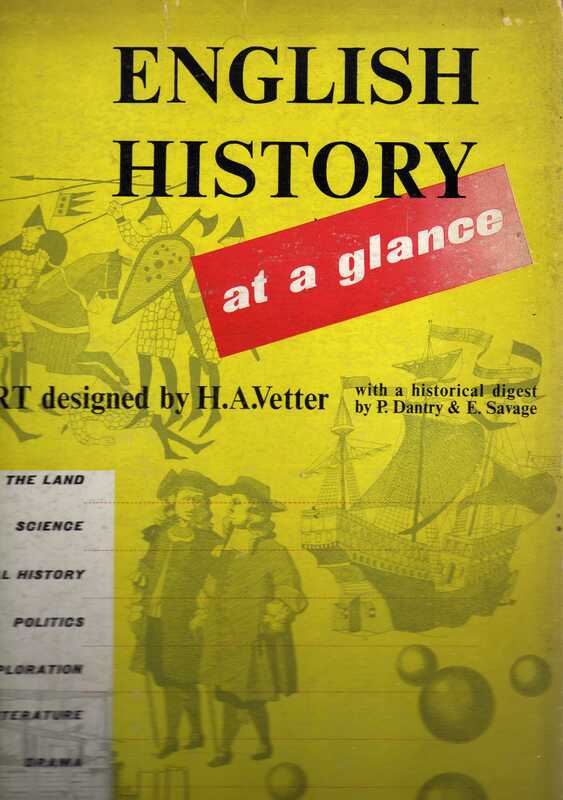 It was a perfect tool for identifying people working ahead of their time, Pevsner’s ‘pioneers’. An innovator in any field might be given a label of one colour to designate the time of his birth, but this might project into a preceding or succeeding period and appear against a background of a different colour if his ideas were out of synch with his age. In the field of architecture, ‘pioneers’ such as Voysey, Mackintosh and Charles Holden are coloured conspicuously in the hue of the following stylistic period, whereas Lutyens carries the mud-brown label of the ‘Romantic and Industrial’ period well into modern times. The Chart ends with a typically Pevsnerian statement: ‘Controversial placing of names is better than no decision on placing at all.’ Pevsner is directly credited with having provided the background notes on architecture that clarify the Chart (while Michael Tippett did the honours for music, and Robert Birley for history); but might he also lurk behind the ‘P. Dantry’ who, with ‘E. Savage’, is named as author of the historical digest ? The designer is ‘H.A. Vetter’. 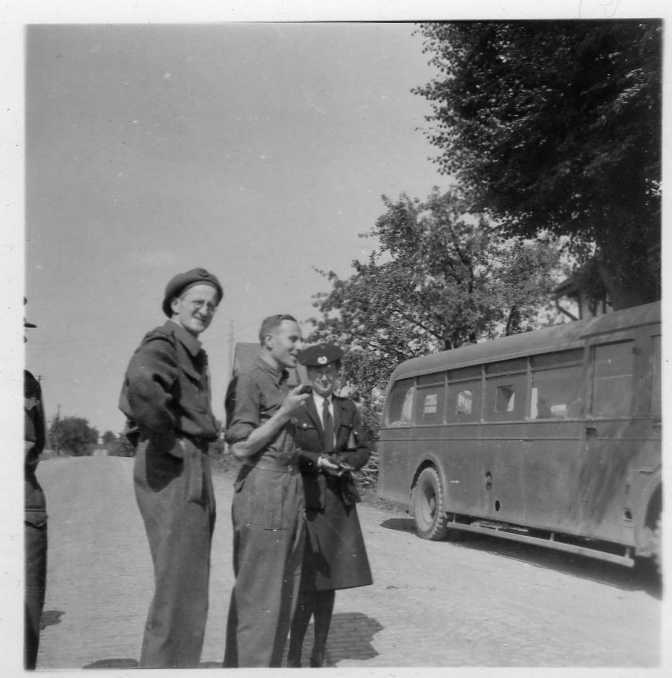 Pevsner’s wardrobe will be the subject of another post – but one of his more improbable outfits was the uniform of a British colonel. 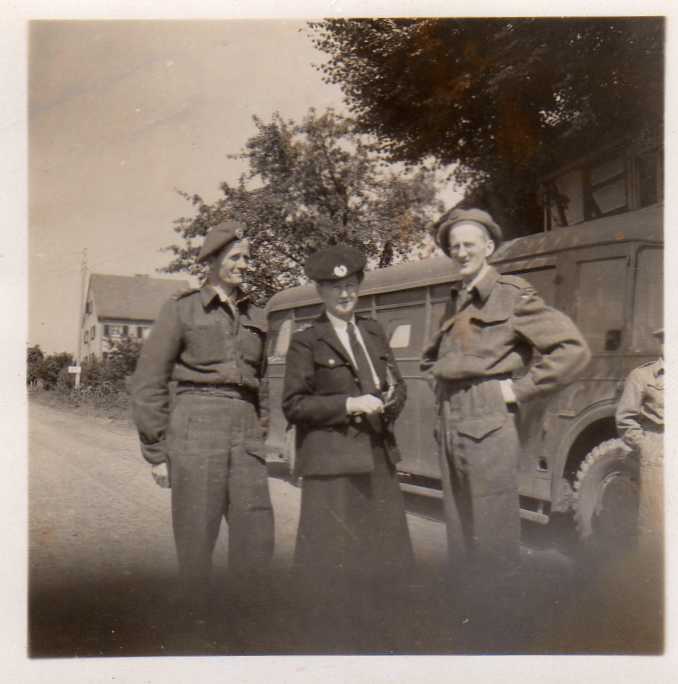 ‘I like my uniform,’ he wrote, ‘it is comfortable, sensible and roomy – I wouldn’t mind always wearing battle dress.’ He wore it as the leader of a team sent in 1946 to the British Zone of Occupied Germany by the Council on Industrial Design. British exports needed to improve in order to compete in post-war Europe and the COID had been charged by the Board of Trade with discovering the secrets of the opposition’s success. 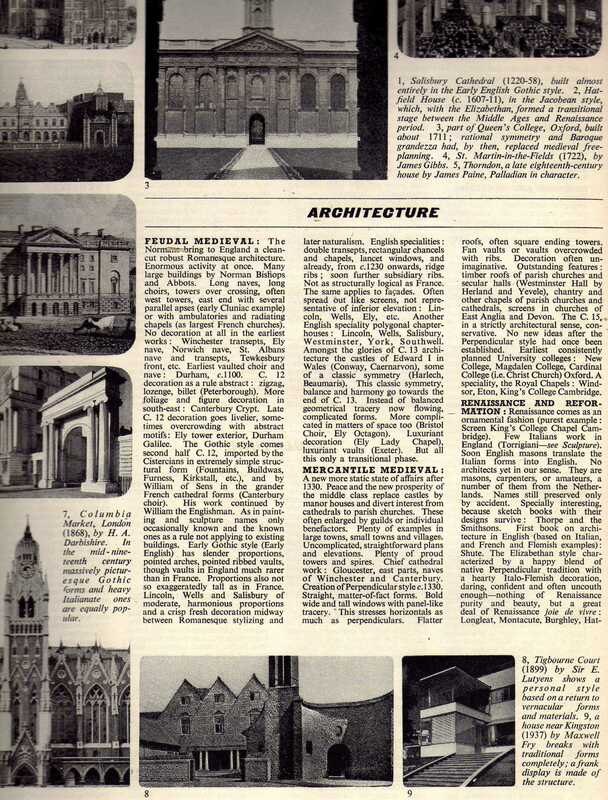 Pevsner’s mission was to establish the current state of German design. He spent his time, he said, ‘looking at Bakelite and hoovers’. But he was also in touch with the British Political Intelligence Department, for whom he was ostensibly writing an article on ‘German Folk Art’. And, perhaps nearest to his own heart, he was consulting on the rebuilding of historic monuments in Germany. One of the COID team’s principal destinations was Frankfurt am Main. 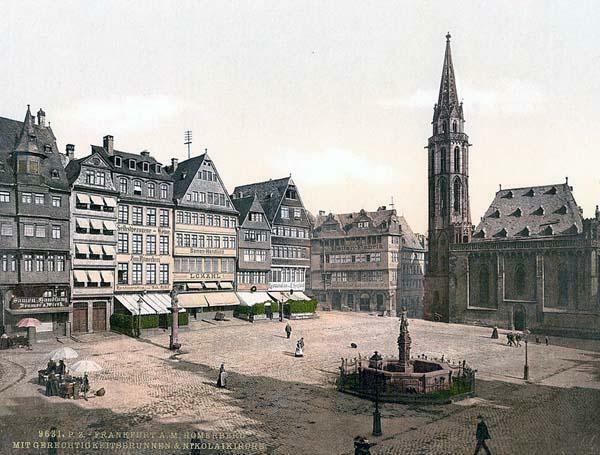 The photographs below show Römerberg, the central square of the old town, with the late-Gothic Alte Nikolaikirche – at the turn of the century, and at the time of Pevsner’s visit two years after the Allied bombing of March 1944 (in the team’s own photograph, with Pevsner in the centreground).